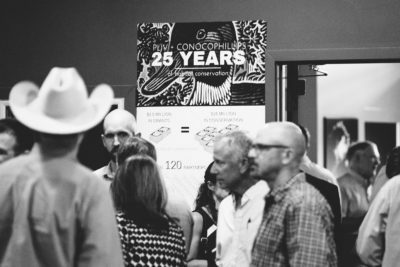 On June 22, 2016, PLJV celebrated 25 years of partnership with ConocoPhillips (Phillips Petroleum). PLJV was honored to have Don Hrap, president of ConocoPhillips Lower 48, and three of our ConocoPhillips board representatives (Kari Gibson, 2015-current; Eileen Dey, 2013-2014; and Tuss Erickson, 1997-2002) at the celebration. “The partnership between PLJV and ConocoPhillips is astonishing. I believe it is the most effective way to deliver boots-on-the-ground conservation—from the collaboration approach to the science and capacity,” said Kari Gibson, PLJV’s current ConocoPhillips board representative. During his remarks, Hrap said he could feel the passion in the room. “Any type of joint venture, any type of partnership, any type of activity that goes on for 25 years has to have something special in it…and when I take a look at this, what I see and what I hear is that we have an alignment of purpose and we have passionate, skilled individuals. I want to thank everyone, all the past people that have been involved, all the people who are currently involved and all the people who are continuing to be involved. We are honored to be part of this Joint Venture.” Listen to Hrap’s full speech. At the reception and dinner, a few of the partners who were there at the beginning shared stories of the early years. 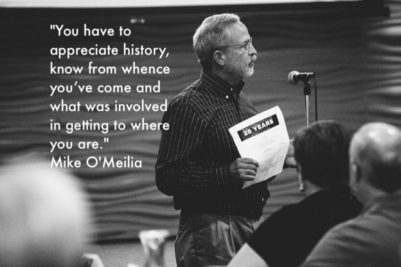 Read some of their remarks below and listen to Mike O’Meilia tell stories of PLJV’s genesis and how the growing partnership was like a big family, squabbles and all. At the celebration, guests received a special photo book featuring some of the important milestones throughout the 25-year partnership. View a digital version of the book below.